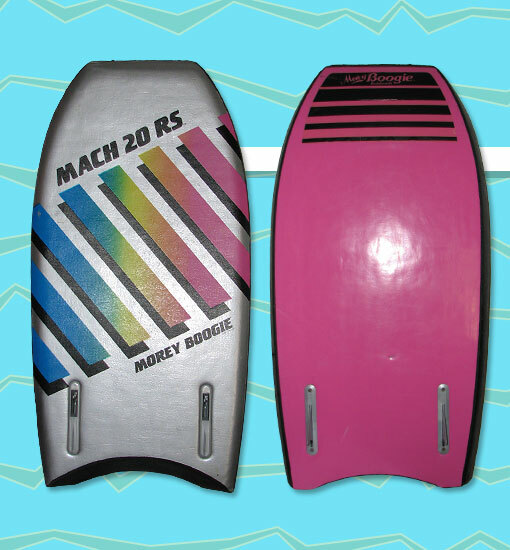 This first-generation Mach 20 RS was considered the top of the Morey Boogie line. The unique retractable skegs could be raised and lowered using the levers on the deck. The skegs lock gently into place with plenty of give in case they collide with a stationary object like rocks or a swimmer. Advertisements claimed that skegs offered "hard edge control on steep, hollow waves", that one or both skegs could be engaged before takeoff, and that the skegs could also be left up "for speed and spinners".